The free online version of Bootstrap Market Gardening continues here. Please respect my copyright and DO NOT copy or reproduce the information you see here without my prior consent. But feel free to share this link with a friend that you think might appreciate the information. or just read on to get the full text of Bootstrap Market Gardening. In this section we will explain the reasoning and research we followed in developing our successful small farm business model. Why say ‘no’ to farmers’ markets? Whoa, what do these guys have against farmers’ markets? Well, as a concept and a model filling a niche for a lot of growers and consumers, not a thing (so you market folks out there, put down your pitchforks!) It’s just not an efficient model from our perspective. Let me explain in a little more detail. When you set up at a farmers’ market, you are never sure what is going to sell that day i.e. unpredictable demand. So you sell out of tomatoes by 8 a.m., and at 1 p.m. bring 50 lbs of unsold cabbage home. And the problem is, next market day it might be the other way around. This leads to lost sales opportunities. And because fresh veggies are a perishable item, it inevitably leads to wastage and spoilage. And if you only go to one market day a week, it’s hard to keep produce at the peak of maturity and freshness. The second major problem is competition for customers. Other growers will have many of the same goods you do. It’s possible to establish a niche by trying to be the earliest grower, or growing unusual or gourmet vegetables. But these all take extra time and attention, and the demand is still uncertain. And inevitably as the season progresses, there is ‘price erosion’ e.g. one of your neighboring market growers has a great year for growing tomatoes, so all of a sudden he is selling them for $0.50 less a pound than you are. Your choices are to match his price, and reduce your profit, or don’t match it and lose sales. Finally, one of the biggest drawbacks from my perspective is that it is hard to really get to know your customers. Yes, you can chat with them (when you are not too busy), and find out a little bit about their preferences in produce. However, even if you find out they like lots of a particular item, your ability to ‘ramp up’ to meet that demand is limited; your season is already underway, and its takes weeks or months to increase production. And the opportunities to find out what other things they might like, that you could supply if you had known, are limited. Its too late once the season is underway! NEXT: Why say ‘YES’ to the Bootstrap model? This is an experiment publishing the FULL TEXT of Bootstrap Market Gardening online. 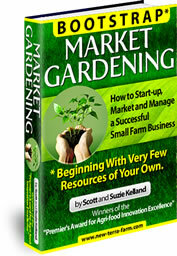 You can also download your own complete copy of Bootstrap Market Gardening plus 5 bonuses and CHOOSE YOUR OWN PRICE. Thinking about raising livestock on your small property? You might want to check out these other books for the small farmer from New Terra Farm.